Job seekers may submit their Comcast application for a chance to work for one of the most successful mass media corporations in the world. Founded back in 1963, Comcast is now a member of the famous Fortune 500 list. The services provided by the company include cable television, broadband internet, home security systems, television and radio broadcasting and venture capital. They currently operate worldwide and continue to expand their service area and gain more and more customers. According to the company’s main employment eligibility criteria, all applicants for Comcast careers must be at least 18 years old to be deemed eligible. Please note that all younger candidates will be automatically excluded from the hiring process. 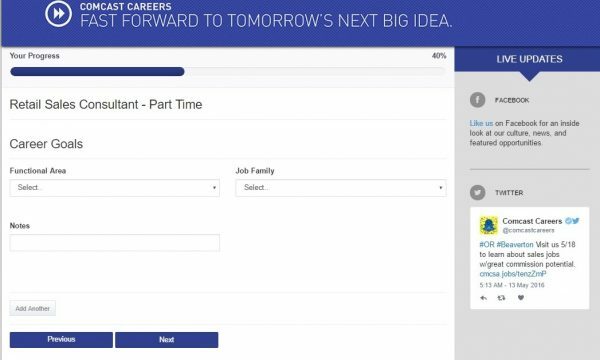 The first step of the Comcast application process is filing out an online jobs and employment form on the company’s careers portal. Job seekers must find the ideal position for their professional and academic background. Then they will have to set up their accounts on the portal and follow the steps listed there to submit their application online. Through the online account, you will also be able to check the status of your Comcast application. You will be to see at what stage your are in the Comcast hiring process and you will receive information when your Comcast application has moved forward. 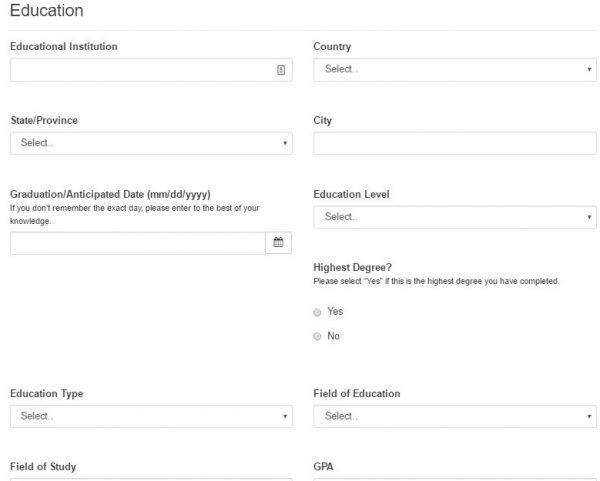 For the first section of the Comcast job application form, candidates will be provided with the opportunity of transferring data regarding their professional and academic background from their resumes or LinkedIn profiles. Please note that the resume itself will not remain attached to the Comcast job application form as the company does not require candidates to submit their CVs along with the online form. 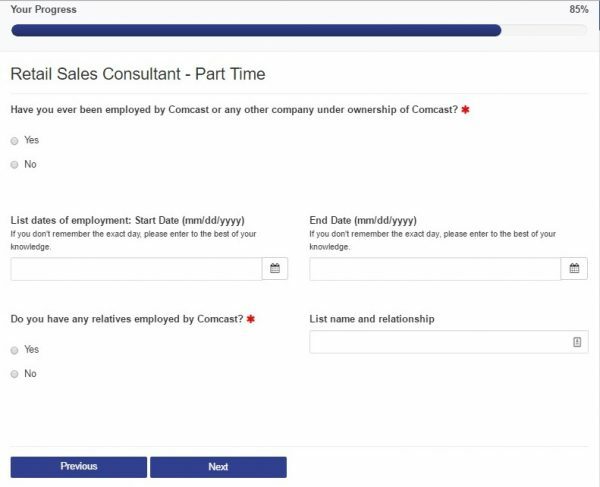 For this section of the Comcast job application form, candidates are required to mention their full names, their e-mails, and their phone numbers. These will be used to contact them about the following steps of the employment process. This section of the Comcast online application form requires candidates to include information about their work experience. If they have provided their resumes or LinkedIn profiles for the first section, some of the data will be transferred automatically. If not, they will have to fill out the form manually. For this section of the Comcast application from, candidates will have to include details about their previous employment. For each position they want to include, they will have to provide detailed information, such as the start and end time of their collaboration with the employers, their position along with the responsibilities that came with it, their start and ending salary and their reason for leaving. Please note that they may include as many positions as they deem relevant for the Comcast career they are aiming for. They will have to list these positions in reverse chronological order, rather than in order of their relevance. This section of the Comcast job application form requires candidates to create an outline of their academic history. As for the Employment section, they will have to list the main programs they have attended in reverse chronological order. For this section of the Comcast application from, candidates will have to include details about their education. For this section of the Comcast application form, candidates are required to include information about any licenses or certifications they might have. They will have to mention the institution which has issued these documents, as well as the expiry date. 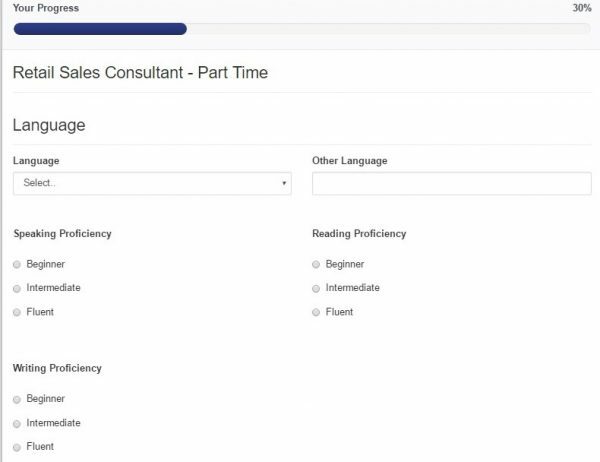 For this section of the Comcast online application form, candidates are expected to include information about their language skills. They should start with their native language and then add other languages that they speak. Please note that they must list the level of proficiency they have achieved in each of these. For this section of the Comcast application from, candidates will have to include details about their language skills. This section of the Comcast online application form requires candidates to mention whether or not they would be willing to travel and/or relocate for job-related purposes. If so, they will have to indicate their preferred areas, as well as their expectations. For this section of the Comcast online application form, candidates must mention the career area they are aiming for. By listing their long-term goals, the hiring managers may get a better idea of their professional aspirations. Candidates may also include notes for this part of the form to point out the particularities of their career goals. For this section of the Comcast application from, candidates will have to include details about their career goals. For this section of the Comcast online application form, candidates are required to provide their detailed contact information. This will be used by the Human Resources department to identify them and contact them via mail, if necessary. For this section of the Comcast application from, candidates will have to include their contact details. This section of the Comcast application form was included for statistical purposes. It requires candidates to mention how they have found out about the position they are applying for. This will help the company’s hiring specialists to get a better idea of the best ways to reach job seekers. This section of the Comcast job application form is also intended to acquire statistical data about the candidates applying for employment at the company. It features a short questionnaire regarding the gender and race of the applicants. Then this section continues with questions about the disability status of the candidates and then their veteran status. 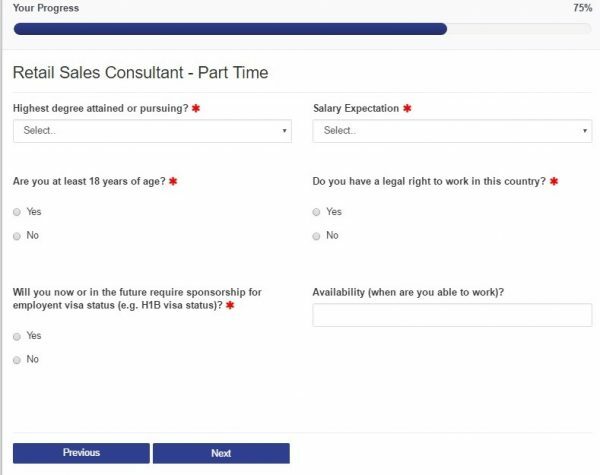 This section of the Comcast online application form aims to make sure that candidates for employment are in line with the eligibility criteria set up by the company. They will have to certify that they are above the age of 18 and that they are authorized to work in the United States. For this section of the Comcast application from, candidates will have to answer the pre-employment questionnaire. Then, they will have to mention whether or not they or their relatives have ever worked at Comcast. The final set of questions is centered on identifying any contract restrictions that candidates might have that could prevent them from meeting the job requirements. This is the final section of the Comcast application form. Candidates are asked to provide their consent for drug testing that might be required for their employment process. After this, they will be able to submit their forms to the Human Resources department for the formal assessment. They will be able to keep track of their Comcast application status on the careers portal. When their forms are labeled “Assessed” they should expect to hear from the hiring specialists. They will be contacted in regards to the interview process. Comcast is one of the most successful mass media companies in the world, which makes their internships some of the most sought-after programs available. Comcast interns get to work with some of the biggest names in the media sector and they have the opportunity to learn some very useful skills. 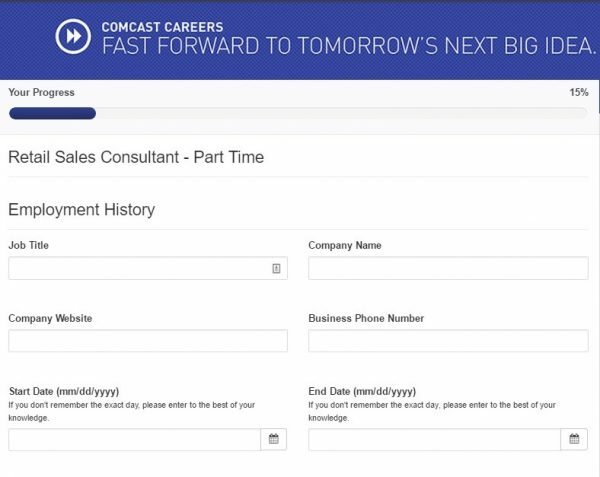 Candidates aiming for Comcast careers in management can find the complete list of available positions on the company’s job application portal. They will have to send their employment forms online to be considered for the positions. The Comcast salaries that managers are entitled to are usually higher than $100,000 as the responsibilities that come with these positions are enormous. Aside from their base salaries, managers are also entitled to cash bonuses meant to repay their dedication to the company, as well as commission bonuses. Comcast Healthcare Benefits: Medical, Dental, and Vision Plans, State of the Art Medical Care, Doctor on Demand, Second Opinion, Center of Excellence. Comcast Financial Comcast Employee Benefits – Competitive Comcast Salaries, Stock Options, Comcast Employee Stock Purchase Plan, Performance-Based Bonus System. Comcast Retirement Benefits – Retirement Plan, 401(k) Plan. Comcast Insurance Employee Benefits – Basic Life Insurance Plan, Supplemental Life Insurance, AD&D Insurance Plan. Comcast Paid Time Off Employee Benefits – Paid Vacation, Paid Holidays, Bereavement Leave, Sick Days. Comcast Special Benefits – Comcast Employee Discount, Legal Assistance, Mobile Phone Discounts, Comcast Employee Assistance Program, Free Lunch or Snacks. Candidates are advised to follow the instructions listed on the Comcast job application portal to complete their employment forms. While the sections in the form regarding their Education and Employment history are not listed as mandatory, we strongly advise them to fill them in completely. Given the fact that they are not able to attach their resumes to their Comcast applications, the information they add to these sections is vital for their employment as if includes the main details about the candidates’ ability to comply with the requirements of their chosen position. 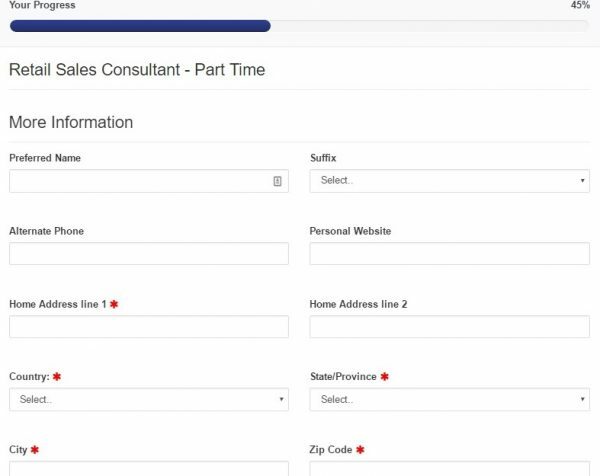 Candidates must make sure that their Comcast applications do not include spelling and grammar mistakes, as these will decrease the value of their forms significantly. As the online form does not feature a special section where they can proofread their applications, we strongly advise them to check everything they have written after completing each section of the form. The Comcast hiring specialists will assess the employment application they have received for each of the open positions and they will select the candidates who are best suited to fill them. Then they will contact the selected applicants to set up interviews. The number of job meetings that candidates must go through depends on the career level and the department chosen by the applicants. As such, they might be asked to sit through one to four interviews before they receive their final answer from the Comcast hiring managers. The Comcast hiring specialists will expect candidates to be familiar with the services offered by the company. If they have never used Comcast cable services personally, they are advised to visit the company’s official website and read all about their offers. Interview candidates must also be able to visualize the involvement of their chosen department in the development of the company, as some of the interview questions will be centered on this. We strongly advise them to go through their resumes and cross-reference their skills with the job requirements of the Comcast careers they have chosen. This will enable them to provide better interview answers, as they would display an integrated understanding of their tasks and responsibility. As far as Comcast interview attire is concerned, candidates can never go wrong with something business casual. The Comcast interview attire should be appropriate for the position one is applying for. Do not go overboard with something too formal or fancy. Your Comcast interview attire should reflect professionalism but also feel comfortable. Candidates can improve their interview performance significantly by going through interview questions that are similar to those that they might get on their job meetings. We have provided a few sample questions that could help candidates get an idea of the tone of the interview and the type of information they will have to elaborate on. Take a look! Why have you chosen to apply for Comcast employment? What do you think makes you prepared to meet the responsibilities of the Comcast job position you have chosen? Could you please name one thing that your previous manager or co-workers disliked about you? Could you please describe some of your best qualities? How would these enable you to thrive in your chosen Comcast career? How has your previous work experience prepared you to complete the tasks of your chosen Comcast career? What can you tell me about yourself that is not included in your Comcast application?